There were official sessions at COP-20 in Lima on Saturday and Monday to assess the progress made by seventeen developed nations to implement policies and programs to address climate change. The seventeen governments earlier submitted written reports, which were then open to questions and comments by all the member parties to the UN Framework Convention on Climate Change. Then here at COP-20, each of the 17 gave a short slide show summarizing its efforts and plans. Each presentation was followed by an oral question and answer period. 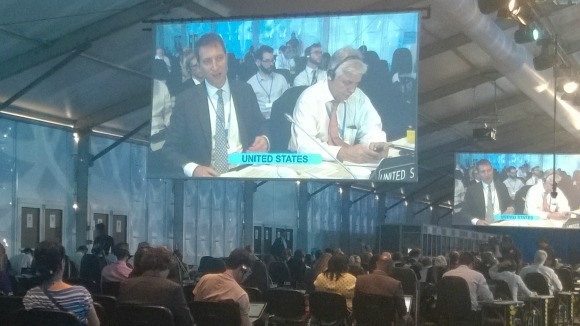 Surprisingly, this is the first such multi-lateral assessment of national climate programs since the UNFCCC was signed at the Rio Earth Summit in 1992. I wasn’t here on Saturday, but listened to several of the presentations on Monday by New Zealand, Portugal, Switzerland, Sweden, and the United States. New Zealand’s slide show had the prettiest photos (of new Zealand’s breathtaking scenery), but the U. S. presentation by Rick Duke of the White House Council on Environmental Quality was the most detailed and impressive. But it did attract several highly critical questions. To Mr. Duke’s claim that one of three key parts of President Obama’s Climate Action Plan was the the U. S. would lead international efforts, South Africa questioned how the U. S. Could lead when it’s own domestic efforts to reduce greenhouse gas emissions had been so insufficient. But no questions were raised about what I consider to be two highly misleading points in the U. S. presentation. First, Mr. Duke listed the EPA’s proposed rules to reduce greenhouse gas emissions from new and existing power plants without mentioning that they are both subject to serious legal challenges and to serious attempts to block them in the 114th Congress. Second, Mr. Duke attributed significant future reductions in fossil fuel use to the increasing use of cellulosic ethanol. He then went on to claim that federal government investments in technology research and development had lowered the cost of producing cellulosic ethanol from $13 a gallon to $2. This claim was backed up on the slide by noting that the $2 per gallon figure was based on modeling projections. It is ridiculous, of course. Despite countless claims over the past two decades that commercial production was only a few years away and despite the fact that increasing volumes (to 16 billion gallons per year by 2022) of it are required to be used by the 2007 Renewable Fuels Standard enacted by Congress as part of it’s (anti-)energy legislation in 2007, cellulosic ethanol is still a pipe dream. As the Washington Post recently reported, billionaire Vinod Khosla’s KiOR cellulosic ethanol company recently declared bankruptcy. Khosla had invested $85 million and Bill Gates $15 million. Another Khosla company, Coskata, gave up on producing cellulosic ethanol in 2012, but not before the U. S. Department of Agriculture had guaranteed $250 million in loans. Range Fuels, which Khosla invested in, went bankrupt in 2011 after getting $46 million in grants from the Department of Energy and $40 million in loans from USDA. All of these companies managed to produce minute quantities of cellulosic ethanol at costs much closer to $13 a gallon than $2. The fact that the associate director of the White House Council on Environmental Quality could claim at a major international conference with a straight face that the cost of cellulosic ethanol has gone down to $2 a gallon because they have a model that says that it should have is only one more of many instances of the Obama Administration’s preference for rosy predictions from models over reality. Next post: If Ultra-Troubled Ivanpah Is “2014 Renewable Energy Project of the Year,” Then How Bad Off Is the Green Energy Industry?